Imagine driving down the road in comfort and staying where ever you like in luxury. 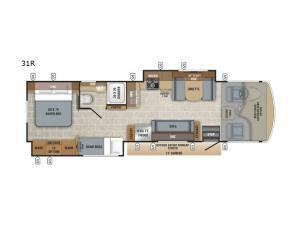 Now imagine yourself in this Alante motorhome with your family. From the two slides allowing plenty of floor space for everyone to move around, to the bunk beds with TVs for the kids, you will enjoy every time you take this RV out of storage. You will find seating as well as extra sleeping space on the living room furniture. And the walk-around queen size bed in the private bedroom gives you a place to call your own. The outside entertainment center with an LED TV mounted on a swivel bracket, the DVD/AM/FM radio and speakers, plus the awning offer an outdoor gathering space protected from the elements. If you need more sleeping space, add the drop down overhead bunk option. This could be the one!